After organizing 113 entries for World Bread Day on October 16th, you would think that Zorra of Kochtopf would want to take a break. Instead, she’s hosting an After Party and encouraging bloggers to choose a bread recipe from the original 113 to recreate in their own kitchen. The round up for World Bread Day can be seen here and you don’t have to have participated the first time to join in on the bread baking and the After Party. So if you missed it the first time, I’d like to refer you to Rule #76: No excuses, play like a champion. My relationship with bread making is a bit love/hate. I love to make bread but it hates to be made by me. The problem is the rising process, or lack thereof. I don’t have a firm grasp, (or perhaps any grasp) on how yeast works and why sometimes my bread rises nicely and others times it’s as dense as a brick. I was thrilled and amazed when my Honey Whole Wheat loaf for World Bread Day not only rose, but actually burst through the top. Those occurrences, however, are few and far between. Despite my bread woes, I keep naively trucking along, hoping that divine intervention will fix my bread problems without my having to actually investigate what’s wrong. With that in mind I set out to pick another bloggers’ bread recipe to recreate. I had a few criteria for what kind of recipe I was going to make. I didn’t feel like making anything sweet so that eliminated a whole bunch of entries immediately. I also didn’t want to go out and buy any new flour. I have bread, all purpose and whole wheat flour and I don’t have room in my cupboards to house anymore. 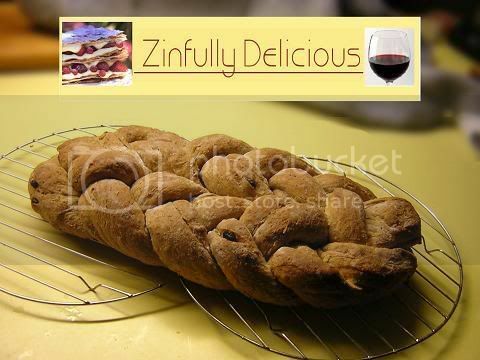 Lastly, with entries from all over the world, I preferred the recipe to be in English, just a convenience thing… The blog that I chose my recipe from was Zinfully Delicious which actually had two entries to World Bread Day. The first was Bruno’s Twisted Oat Raisin bread, the second was Duane’s Old Fashioned Cinnamon Swirl loaf. Duane’s loaf, though it looks delicious, did not meet the criteria of not being sweet and so I was on my way to making a Twisted Oat Raisin bread. Bruno made two loaves from this recipe, but as I’ve mentioned, I have bread difficulties. I ended up making one loaf, (using the whole recipe). To jazz up the fact that I only had one loaf I decided that instead of a normal three strand braid, I would make a six strand braid. It didn’t seem to be an issue that I don’t know how to do six strand braids. After fiddling with six strands for a while, I gave up, made two three strand braids and stuck them together. As usual, my bread did not rise properly and turned out dense. This is by no means a consequence of the recipe, I’m sure normal people could recreate Bruno’s recipe without a hitch. The taste is good, mine is just dense. I’m used to that by now. 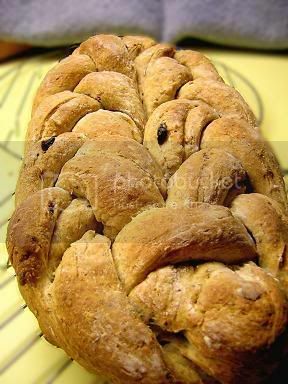 One day I will learn to make bread properly and when that day comes I will re-recreate Bruno’s Twisted Oat Raisin loaf and do it justice. Posted by Brilynn at 11:01 a.m.
You make me laughing! :-) Just don't give up to bake bread, it needs practice. The problem with the six strangs is also known by me. ;-) But you solved it masterly. From that beautiful photo I can't tell if your bread is too dense or not. It looks lovely and very inviting. I like your stick-to-it-ness. You'll be making light as air loaves in no time! I find pita bread tastes GREAT home made..
umm.. in case you can't figure out what I am talking about.. I meant to type "hummus" yeah.. I made the same typo twice! Bread does take time. When I moved up to Seattle from Phoenix I really had to relearn yeast breads in a way since I was not used to the humidity. Just takes time....patience is the key to all things pastry. Well even if it is dense - it looks soo great. I want to participate in this - bread baking here I come! Looks great Brilynn...I have trouble braiding just 3 strands! Can I also just say that the Wedding Crashers reference made me really happy?